Bigg Brass stories at Techdirt. stories filed under: "bigg brass"
Back in 2010 we wrote about rapper Dan Bull's excellent "Death to ACTA" song and video, which is a parody of Jay-Z's "Death of Autotune." 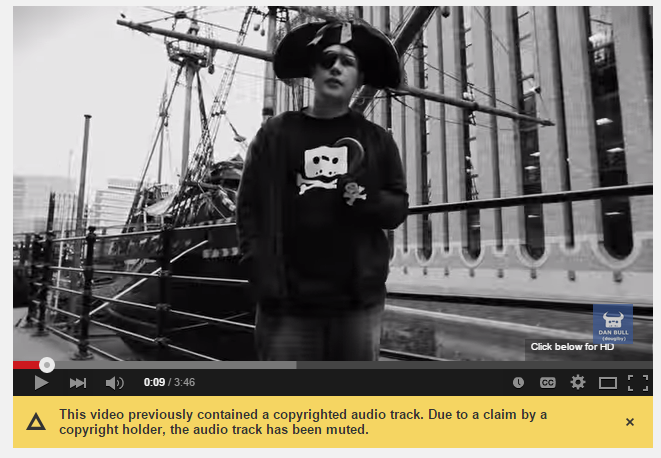 In 2011, we further wrote about the MP3 of that song (which Bull distributes willingly on file sharing platforms) being taken down from Mediafire due to a questionable takedown request. Now, years later (well after ACTA is pretty much long dead), Dan's discovered that his video on YouTube was just silenced due to copyright claims. He wondered what it was about and discovered two claims on the video -- one being ridiculous, with the other being merely questionable. The ridiculous one is the claim about Bigg Brass's song, "Death of Fake Rapperz". That one, like Dan's, uses the backing track from Jay-Z's "Death of Autotune." The actual track that Jay-Z sampled is "In the Space" by Janko Nilovic and Dave Sarkys. It's likely that Jay-Z licensed that track (though he's run into legal trouble at times for failing to license some tracks). If anyone would have a claim over Bull's track then, it would likely be those guys. Here, it appears that Bigg Brass is working with the big digital distributor, The Orchard, who didn't even bother to figure out that Bigg Brass was using a sample of his own and just went hog wild stupidly going after others' music. The Universal Music Group claim is slightly more reasonable, but only slightly. Again, the actual music is not Jay-Z's but Nilovic's and Sarkys' and they don't appear to be the ones complaining. At the same time Jay-Z has been quite public about his support for artists remixing his tracks into other songs saying that he's "honored" when it's done. It may be that Jay-Z doesn't hold the copyright for DoA, but even so... it seems like a pretty weak claim to go after Dan Bull. 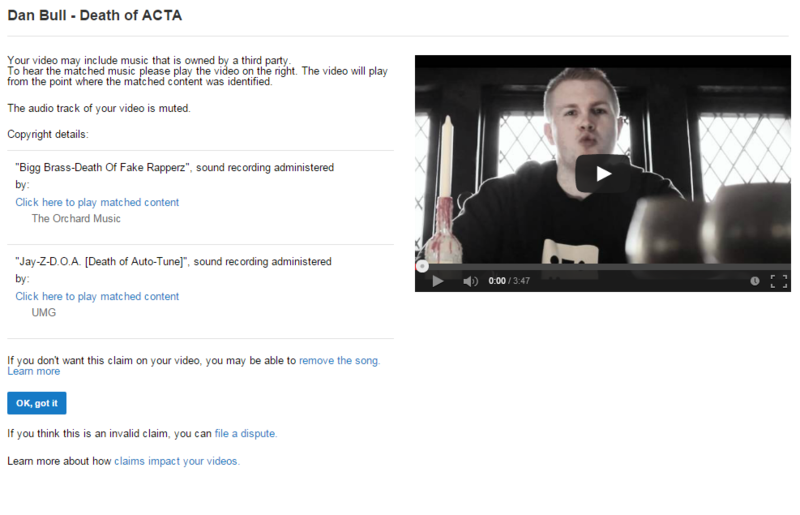 And, of course, you can find a ton of other videos that use the same backing track for their own songs. Here's one. And another. And another. And another. And another. And another. And another. And another. And there are a lot more. I'm just getting tired of cutting and pasting. And none of those other ones are silenced.